Jesus freak Hideout (John DiBiase): We watched Live Revelations and really enjoyed it. How'd you pick the Erwin brothers to direct it? Mac Powell: Well, we've done a couple of things with them before. They did our last EPK [Electronic Press Kit] and did a great job with it. So we just thought, "Okay, why not them?" I've been bragging on this DVD, but not because of us, since we didn't do anything with it. We just did what we do. 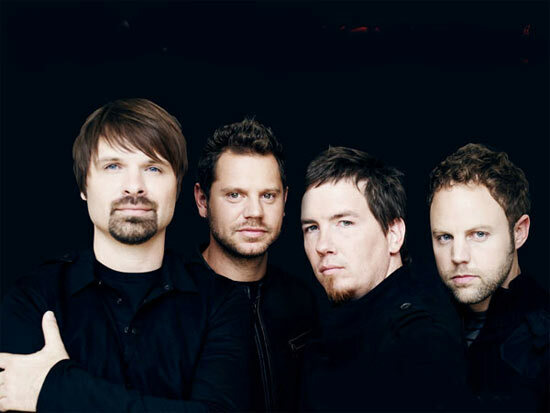 To me, it's the best Christian music DVD I've ever seen because of how they put it all together. It was amazing and it was exactly what we wanted. There's a lot of great live footage, but it's more of a documentary really. JFH (John): Was it hard to get used to the cameras being around? Mac: Yes and no. They were out for about four or five days, so it wasn't like it was a whole tour or anything like that. It was enough to get a glimpse into what we're doing on and off stage. I don't think it was hard. But at the same time, it wasn't at all one of those things where you forget that they're there. Like, we'd be in this room for five minutes, and I know she's there with the video camera (*points at Amy who's recording the interview*). I can't get it out of my mind. JFH (John): Were your families aware of the camera at all times? I noticed when you saw your dad at the show and you were talking to him, it seemed like he wasn't aware that there was a camera. Mac: I think in that shot they were far away. I don't think they were close. There might've been a couple spots where they came up, but no, that's my dad. He's crazy. He likes cameras. He likes being in the spotlight. He's always the center of attention because he's very loud and boisterous. He doesn't want that necessarily, but that's just who he is. Cameras don't bother him. JFH (John): How much of a difference does it make to have a road pastor? Mac: It makes a huge difference. You give him that authority to speak into your life. I don't know if you've met Nigel [the road pastor], but he's really great. He's not overbearing at all. He does just enough. The main thing that I always talk about in his ministry to us is just being that accountable person. Not necessarily that he's asking us questions all the time, but that he's the one that we give the authority to make the schedule up to say "Okay, we're studying at this time, we're gonna sit down and do a prayer time at this time." If we didn't have that, we would still do it, but it would easily slide by. A couple weeks would go by at a time where we'd go "Oh yeah, we didn't pray!" It's something that from the very beginning, we've always had people come out with us and just kind of have that authority over us and have someone like that who's with you for years and understands the industry and understands what we're going through, you know? Sometimes there are the super-spiritual guys who are just too legalistic about it, and Nigel isn't at all. He's very good at giving us our space, and yet at the same time making us be accountable to those things. The best thing is just to have somebody there to talk to. A pastor's role is to preach on Sundays, and he does this and that, and he does hospital visits and stuff like that. They're all important. But most importantly for me, it's just nice to have that guy that I can ask questions to and kind of talk to, and have it be someone else than just the guys in the band. Even though we're really close within the band, there may be times where we've got a problem with each other where we want to talk that through. It's great to have Nigel for those times. JFH (John): What was your inspiration for the idea to have the video camera as the intro for the show? Mac: Tai Anderson. It was all his idea. I didn't like it. It turned out cool. Well, it's not that I didn't like it. It was hard for me to do, because when I came out, I'm ready to see the audience. I couldn't do that. I had to come out and look into this little camera as opposed to saying "hey" to everyone in the audience. So I didn't enjoy doing it. It looks cool. But that was his idea. JFH (John): I remember seeing it in person. That was before the DVD. It was a nice touch. Mac: Cool, I'm glad you liked it. So you didn't say "Why isn't he looking at us in the audience?" JFH (John): No. I thought it was a cool moment. Mac: doing it, it took a little more time for me to connect. JFH (John): Okay, that makes sense. So just hold a grudge against Tai for that, right? JFH (John): Was there anything cut out from the film that you wished was in there? Mac: Hmm, not that I know of. I do wish that we had had a little more say in the editing of it. But being the artists that they are, as editors and filmmakers, they were like "No, we're gonna do this," which was fine. I love how it turned out. Like I said, I think it's the best Christian music piece I've seen. If we would've had more say in how it was edited, it probably wouldn't be as cool. You have to give people their place in their calling and how they do things. JFH (John): Was there any moment that you wish wasn't in there? Mac: There is one thing that I wish wasn't in there, but I'm not gonna tell you about it. *laughs* If I did, it makes it bigger than it really is. JFH (John): You still play the song "Thief" live, although redone. Have you thought about resurrecting any older songs? JFH (John): We wanted to see that tour! Mac: We'll tour with them again. Not to ruin the surprise, but we go out into the audience when we do the acoustic set. We can't do it all the time because of how buildings are set up, but we try to do it every night that we can. We go out there and sometimes we ask for requests. So many people ask for "Consuming Fire" and "Blackbird," which are both from the first record. We've done "Consuming Fire" acoustically, but we haven't done it as a full band for two years now. I never answered the question though. No songs come to mind, but that would probably be one. I really like the change we made to it. That change from "Thief" came from Chronology, Volume One. I think we redid it for that album. Monroe Jones, who produced like three or four of our records, came down to Atlanta and helped us redo it. We redid two songs. The other one was "My Hope is You." For some reason that one didn't click, it didn't work as cool as "Thief" did. Who knows if we did "Consuming Fire" if it would be cooler or not as good as the first. JFH (John): I know it wouldn't make much sense to play it, but I'd love to hear it again... "You Make Me Mad." I know it's kind of from back in the day... I loved that record (Conspiracy No. 5). I still do. Mac: Yeah. That was a fun record. What did you think about Revelation? JFH (John): I love it. Mac: Where would you rank it? JFH (John): Well... Ha, the tables just turned. My favorite record has always been Conspiracy No. 5. Mac: Was that the first record you heard from us? JFH (John): No. I picked up the first one after seeing the band live on tour with Seven Day Jesus and All Star United in 1996. And then I had heard Conspiracy No. 5 when my brother brought home the pre-release from the Christian bookstore he worked in and I just loved it. I remember... you guys started playing those songs before the record came out, right? Mac: Yeah. That was one of the few times we started doing songs before the record came out. Y'know, that is the only record we've made that never went gold? Well, the new one hasn't yet, but it's about to. It's disappointing. That record reminds me a lot of Revelation. Just that we were so trying to do something different. JFH (John): Yeah. Conspiracy No. 5 just had a lot of outside-the-box stuff for you guys. It was a very unique record, a very edgy record, but it also had a lot of... I mean, "My Hope Is You" and "Your Love Endures"? My goodness, that's a fantastic worship song. That's a song you should bring back, too. Mac: That's a song that I was always disappointed that nothing ever happened with it. Cuz I thought that was an awesome song! Mac: Yeah, see, I'm surprised you said that because a lot of times people's favorites of ours are the first record they've heard. No matter if it's the very first one or... It's just hard as a musician to hear that cuz I know that we've made much greater music than the first record, but for some people there's just something about it that they love. Mac: See, my favorite Pearl Jam record is Ten. I think it's because it's the first record I heard from them. JFH (John): So, yeah, for me I guess if any record rivals Conspiracy No. 5, it is Revelation. So I'm still torn whether it tops it. But if anything, it's second. Mac: We've often felt like we wanted to redo Conspiracy No. 5. And go in and remix... well, some of it was remixed for Chronology, but we were so disappointed in how the recording process was very different than we thought it would be. Without going into details, it doesn't sound as good as we [hoped]. I think at the time we didn't realize that, but now, listening to it, it's just so much going on that it's a little confusing. But with that record, we just wanted to prove we weren't Hootie and the Blowfish. Our record came out first and then their record came out, and they're from the south, rootsy rock music, and everybody just assumes [we copied them]. JFH (John): We gotta go, but what's the plan for the rest of the year? Mac: Briefly, the plan is: we're traveling around the world quite a bit. We're going to Europe in June, and Brazil and South Africa in November. Glory Revealed II is coming out. It's a little bit more pop oriented than the first one. A little more radio-friendly, I think. It's such a cool project. There's a lot more stuff to it. Before, it was very, very bare bones. This time we actually have drums and a lot more instrumentation. So yeah, check it out! I'll be interested to see what you think. Because it's so different from what we do, it's not for everybody, but there's something unique about it. 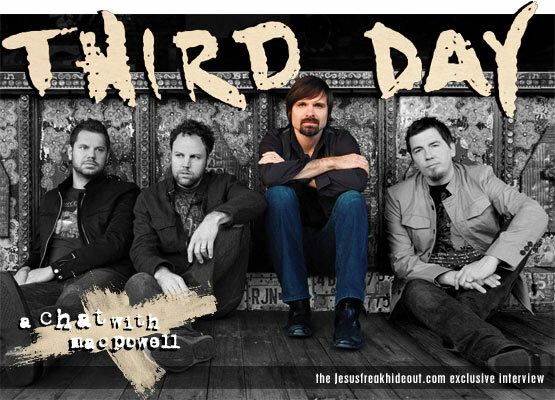 Third Day's latest project, Live Revelation, is in stores now!